Anthony Watts has posted another alarmist article, this time about how England might suffer from an ice age some time soon. The guest opinion was penned by John Hardy (UK), and was posted under a painting by Abraham Hondius: “The Frozen Thames” 1677 (during the Maunder minimum) (archived here). One of the important messages from this article is that one would be very unwise to pay any attention to anything written at WUWT. I don't know why deniers have such an aversion to learning about climate. Nor do I know why they are so shameless about showing their ignorance. Nor why they are apparently unwilling or unable to do basic fact-checking or research. Two separate indicators of climate change suggest that there is a risk of substantial cooling from 2017 onward. There is also likely to be a gap in energy production worsened by hasty climate change policies, making it three unrelated problems at the same time. In the worst case we could have rolling blackouts in Europe in the next few years. an increase in greenhouse gases causes a rise in temperature. Number 4 in our list – Aerosols – are rather unpredictable. Number 5 – Milankovitch cycles – are very long. No one credible on either side of the argument maintains that GHG will cause a step change in climate in the near term. This leaves number 2 – Solar cycles, and number 3 – ENSO. Historical data and present trends suggest that both may be heading for a strong downturn at more or less the same time. What John is referring to when he talks about solar cycles isn't the 11-year solar cycle. He posted a chart of sunspots from 1990 to the present and said that it was similar to the pattern at the start of the Dalton minimum. He also said it might be coincidence. If (and only if) previous patterns are repeated, we are now headed into the “La Nina” part of the cycle. If this occurs we would be likely to see a reduction in global average temperatures, although the correlation with temperature appears to be different in different locations. If he means that there's likely to be a La Nina soon, then there's a 50:50 chance he's correct. On the other hand, if he's arguing that in the immediate future there will be a shift to a period where La Nina's dominate, then the chances of him being correct are much slimmer. It is more likely that the Pacific has just recently entered a warm phase of the PDO, which is dominated by El Nino conditions, not La Nina conditions. John only included a link to the MEI. Here is the chart from NOAA. I've added shading to indicate the phases of the Pacific Decadal Oscillation (PDO) - warm phase (pink) and cool phase (blue). It might be too soon to categorically say that the PDO has entered a warm phase. A couple more years will probably confirm it or otherwise. If the PDO is now in a warm phase, then the Pacific will be dominated more by El Nino conditions than La Nina, and this will push up the rate of global warming for a while. However, does it follow that if 2016 is another record year that the UK will experience record weather too? Jeff Knight is a climate scientist with the Met Office Hadley Centre. He said: “Global mean temperatures are not a good way of forecasting the year-to-year variations in UK climate, which depend much more on a range of local factors including pressure patterns, wind directions and sea temperatures around the UK. 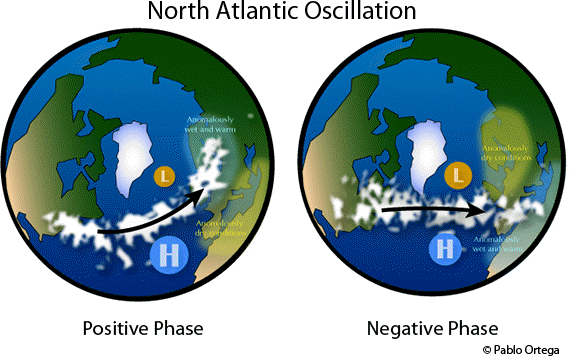 The NAO [North Atlantic Oscillation] is a seesaw in atmospheric pressure that helps direct the flow of winter storms across the Atlantic. When the contrast between high pressure over the Azores and low pressure in the far north Atlantic is stronger than normal, the NAO is said to be in a positive phase. This usually drives mild Atlantic storms into northern Europe but keeps the Mediterranean region comparatively dry. But when the contrast is lower than normal, the NAO becomes negative and opens the door to cold, dry Arctic intrusions into northern Europe and wet, slow-moving systems across the south. I'm not in a position to analyse this, but it does look to me as if the NAO may be now in a positive phase, which suggests a wetter, warmer UK. You'll notice the strongly negative index in 2010 which coincided with a very cold year in the UK (relative to other recent years). For a more comprehensive overview of the impact of the North Atlantic, there's a really good website by the State Climate Office of North Carolina. I haven't mentioned the Atlantic Meridional Overturning Circulation (AMOC) and neither did John at WUWT. Changes in that will also affect weather in Europe. I've written about that previously and included some references to HotWhopper articles below. We would be extremely unfortunate to be hit by a Younger Dryas magnitude event; but two of the main factors correlating to earlier climate changes appear to be heading for a strong downturn at the same time. If we are hit by a combination of a very strong La Nina at the same time as a repeat of something like the Dalton minimum we could be in for some cold winters. 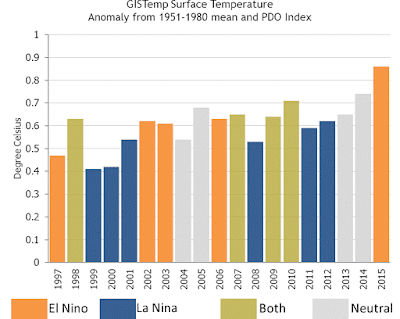 The strongest La Nina was the one from 2010-2012 and there wasn't a huge drop in global surface temperature. 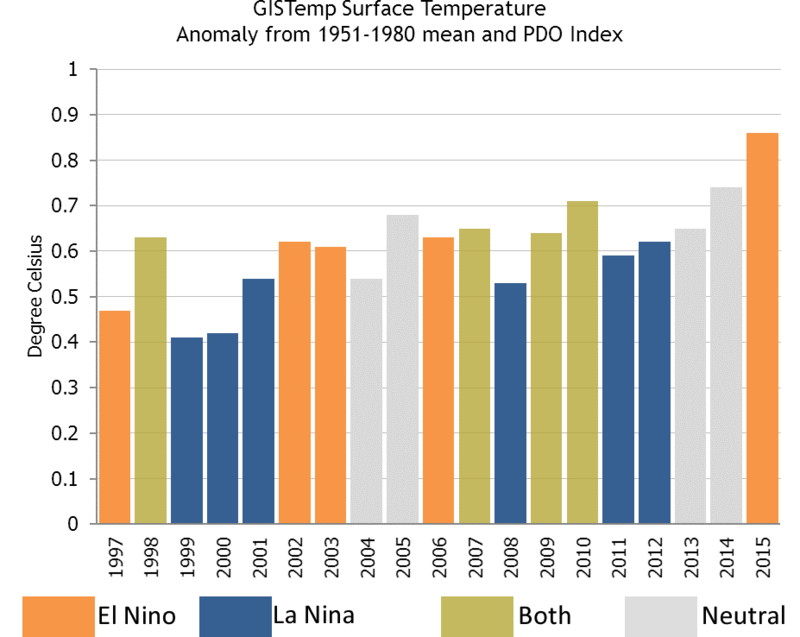 In fact the globally averaged temperature then was higher than it was in any other previous La Nina year. The other point is that it wasn't the change in incoming solar energy that caused the cold years around the time of the Dalton minimum (1790–1830). The drop in global temperatures was largely because of volcanic eruptions. The other main point about the chart above is that it shows that for there to be a comparable cooling in the near future, there would have to be a huge drop in temperature in the region. The two most recent ten year periods have been the hottest in the entire 360 year record by quite some margin. UK electricity security and greens killing grannies? The uncertainty of the power supply, caused in part by green opposition to coal and nuclear, could make it a triple whammy. Rolling blackouts are a possibility, particularly on cold, still, evenings. To some pensioners, alone in the dark on a freezing night with heating inoperative, it would mean a lonely death. Folk with the honourable intention of “saving the planet” may instead be killing their grannies. According to Grubb, the risk of electricity shortage may be high this year but will ease off following the introduction of reserve capacity under the capacity market and the delivery of new interconnectors and demand response solutions that are due to come online next year. "This coming winter is the last one for which we don't have the added incentive for stuff to be available under the capacity mechanism," he explained. But although measures are in place to deal with the immediate effect of the coal plant closures in the UK, industry insiders are warning a failure within government to present a long-term roadmap to decarbonise the power sector means problems are being stored up for later down the line. Paul Massara, former chief executive of energy giant RWE npower, believes repeated market interventions and the lack of a long-term decarbonisation strategy is causing serious problems across the energy market, hampering the ability of developers to step in and bridge the gap left by necessary coal closures. "What we've seen is an incoherent set of strategies which is causing problems in the marketplace," he said. "So, yes, the coal phase-out is good... [but] the problem is that we have created this environment where the free market is not working." Nevertheless, to blame "greens" for killing grannies is going too far in my opinion. Remember the UK is governed by the conservative party at present, not by leftist, warmunist, commie, fascist, socialist, Lysenko, bleeding-heart liberal greenies. None of the reports referred to was opposed to closing the old outdated coal-fired power stations. They were more about how to get enough electricity to meet ongoing and future electricity needs for the country. I suspect that leaving the EU won't help in that regard. Whether it will hinder, I don't know. The other point is that UK taxpayers have to pay a lot in subsidies to keep the old outdated and costly coal-fired power plants going. As far as I know they are not owned by the government, so it's not the government directly shutting them down. I think it's happening because the government will stop paying the companies to keep them open. If anyone has information on this, do let us know. There's a report of one station that was due to close being kept alive by government handouts. Resourceguy, like me, wondered why John didn't mention the Atlantic. So the Atlantic Ocean didn’t make the cut? ...decline in the CET is already under way. decline in the CET is already under way. You can decide for yourself from Figure 5 above or from the chart below. Since 1950 the linear trend is almost as high as the global, rising at 1.6 °C a century. When Leif Svalgaard disagreed, climatereason said words to the effect that an ice age must be coming because his tomatoes aren't doing too well this year :) Well, not quite. What he did say was that it has only been warm because it was warm. The last full year was 2015 and whilst 2014 was the warmest year in CET the trend to the end of 2015 was still slightly down, with different seasons showing different trends as per my article. The warmth of 2016 is down to a warm january and February but other months have been coolish.its not been at all a good summer over here and my tomatoes and runner beans are suffering! cirby has the answers and says, in any case the world is about to cool down. I wonder how long he or she has been saying that? If I were a power production hardware company, I’d do a little pre-planning. Sketch out the requirements for building and selling a LOT of gas-fired turbine power plants, for example. They wouldn’t have to be state of the art, but they would need to be built in a short time frame. markstoval fully expects an ice age to cometh any day. Would he bet on it? (He'd lose.) He also thinks that silly progressives want to take down western civilisation. What planet does he live on, can anyone tell me? I fully expect the climate to get much colder in the near future, based on many factors. But the one factor that I would mention first is that the climate has been cycling hotter and colder for a long, long time. Why should it stop now? Just because silly progressives want to tax CO2 and take down Western civilization? I think Mother Nature will continue to be the dominate force in climate — not puny mankind. Sorry, forgot to mention that you are of course right about our lack of energy supplies. Successive govts seem to have wilfully ignored the need to provide sufficient amounts of affordable base power. Our latitude makes us unsuited to solar power and our wind is too intermittent to be reliable , especially during a cold windless winter high pressure event. Should Hinckley point nuclear power station, approved today, actually go ahead, it will be a dozen years until we feel the benefit. In the meantime perfectly useable power stations are closed in order to meet our carbon reduction strategies. We must hope that the coming winter is as mild as the last one, second warmest in CET. The warmest was over 150 Years ago. We have just one green MP in the UK Parliament. She's rather outnumbered by MPs and Lords with connections to the fossil fuel industry. Ultimately, what they have to have is the return of Matt England's divine wind. A mere La Niña won't help. "It is possible for example that rising temperatures cause an increase in carbon dioxide rather than the other way around"
Such people seem to be incapable of accepting that these are not mutually exclusive options. The fact that warming increases CO2 does not make it impossible that rising CO2 causes warming. In any event, the repeated claim that the current rise in CO2 was caused by warming has to be the dumbest of denier claims. One thing to consider when debating if there has been a downturn in CET temperatures in recent years, is that before the downturn CET was rising almost twice as fast as global temperatures. The downturn could just be us pausing to let the rest of the world catch up. Or it could just indicate how variable the weather is here. In a way this is saying the same thing twice. The NAO is not a real oscillation, just an index for a certain characteric for circulation patterns (or jet stream pattern) which itself changes rather erratically. Don't think of the NAO as some kind of weather driver - more like it IS the weather. The situation wrt for instance EN/SO is different, this is weather-causing. I think the same could be said for the Pacific Decadal Oscillation (PDO) - it's a measure of the state of the ocean rather than a cause of the state of the ocean. As you say, ENSO events are different. They do drive the weather. The PDO appears to be the sum of several processes. The cause and effect relationship in ENSO is a lot simpler. 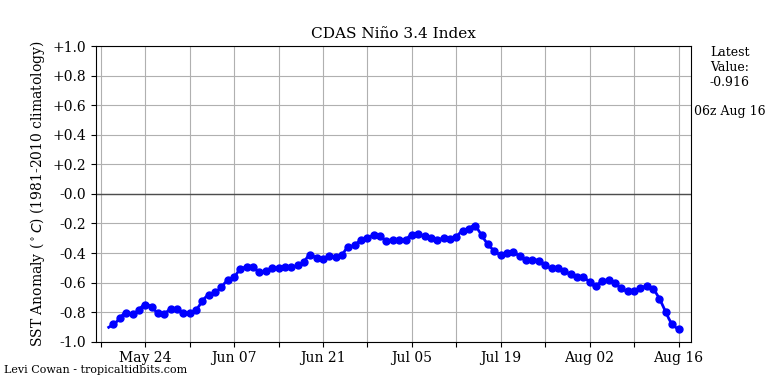 I was glad the great El Nino went to plan and the temperature spike showed up in the troposphere data set - I even told a bunch of deniers to watch out for it. I am not so sure about the PDO. On Politics Etc., I started hinting/predicting the PDO was about to go positive well before it did. The Water Chef and Tsonis and Curry were predicting flat until 2025 to 2030. Professor Curry is still talking about a negative phase of the AMO being somewhere in the near future. So when the blob showed up it became very important for some people make certain the blob was not the same as the positive phase of the PDO. How would they know what kicks off the positive phase of the PDO? The last time the PDO went positive nobody knew there was a PDO. Was there a blob in the 1970s? Could there always be a blob that announces the PDO is going positive? The blob is gone and it does appear the PDO is staying stubbornly positive. This looks nothing like 1998 when the PDO crashed. This heatwave/surge in global warming is not done. I recall that the Water Chef was the big cheerleader for Tsonis at Curry's blog. Tsonis has misguided the focus on ENSO much like Lindzen misguided the mechanism behind QBO. There is now a growing indication that ENSO is deterministically periodic with a sporadic metastable point. The metastability is due to the arbitrary nature of the odd-year vs even-year alignment of a biennial forcing. What makes Tsonis a hypocrite was that he both paraded the chaotic nature of ENSO, yet also made outrageous projections for many years out (such as his 2025 to 2025 claim that you mention). So you can see that people like Tsonis and Curry are not interested in the science but in furthering their own agenda of creating FUD with respect to climate. And now that Tsonis has joined the board of the GWPF alongside Lindzen, its clear what his agenda is. My own prediction: I predict that well before they years 2025 to 2030 scientists like Lindzen and Tsonis with be relegated to the dust-bin as their theories are overturned. JCH, you are right about the north Atlantic cold blob disappearing. I looked at NOAA's global land-ocean maps, and the blob is there in March and April, stats to diminish in May, and is all but gone in June. Interesting. metzomagic - I was actually referring to the Pacific blob, but I also follow the North Atlantic blob. The AMO faithful think it is on the verge of going negative. Well, how can it go negative if the huge blob can't send it negative? What else is left to get cold? Before the Pacific blob, the PDO was actually in negative territory. Before, during, and after the gigantic North Atlantic blob, the AMO remained stubbornly positive and barely reacted to the nasty menacing blob of frigid water. There is a new paper out about the future of hiatuses and surges, and the two blobs sort of go along with it: we cannot really chill; we can definitely overheat. There is a strange correlation between deniers and being wrong. For whatever reason (which I simply cannot fathom), deniers are always wrong. But before you jump to any conclusions, let me tell you why! It can't be that they are all stupid, nor can it be that their science is inaccurate or cherry-picked, I suspect that the real reason lies with the inability of the climate to cooperate with their demands and assumptions. Obviously, something must be done about this because it sure makes this group look like babbling idiots which we know cannot be true since they have luminaries like Anthony Watts and Richard Lindzen championing their predictions. Both of these individuals (and many more of their kind) combined have more credentials and experience then all of the other so-called "scientists" out there that claim the planet is actually warming (if you can believe that) despite the obvious and clear evidence that it's just getting warmed-up for a major cooling event (ice age). You do a great job here Sou but somehow you're always wrong about these guys. Their correlation between denying global warming and being wrong is simply because the climate doesn't cooperate with these experts in climate science! However, that doesn't make any of these guys wrong, now does it? It just means it hasn’t happened yet, but it most certainly will! That actually makes these guys quite prophetic and worthy of our respect and attention. Who knows? Maybe they will even be proven right about some of their other points too that you’ve mentioned. You think they’re conspiracies right? Well, what if they’re proven correct when the world finally realizes the truth behind their claims? It’s not conjecture when your right! Only time will tell who's really right here and I'm betting my money on these champions of fact versus your incessant fiction! You should get on board here with them yourself otherwise you're going to look like an idiot for taking the wrong position, again and again! lol SAcres, nice appeal to authority. My scientists, er 'luminaries w credentials', shine brighter than yours. Hardy har har harrr. And 'it hasn't gotten cooler yet b/c the planet is warming, as climate scientists have shown over and over again, but that only proves it will be cooler someday.' The intelligence of such an argument is astounding, except 'Not'. For the record, my blog is perfectly clear on where I stand on this topic. My 'appeal to authority' should have been obvious enough. It would have been obvious to most HW readers, Survival Acres. At least those who know you here and around the traps. Have you considered deniers are said to be always wrong because THEY ARE always wrong? And are you seriously describing Anthony Watts as a "luminary"? Anthony Watts and Richard Lindzen have financial incentives to be climate change dissidents. You are basically arguing against using scientific evidence to support the theory of AGW, because you think new evidence might support a different theory - well OK then please shut up and wait quietly for your new evidence instead of jumping to conclusions. >>And are you seriously describing Anthony Watts as a "luminary"? No. It was clearly tongue in cheek, Harry. I wondered if Harry was doing a straight-faced Poe on Poe! I am fond of the way that language can be stretched to provide entertainment. The use of 'luminary' to describe Anthony is a splendid example. I wouldn't have gotten beyond the terribly low brow use of words such as 'suppository'. Guys, check the blog first. Reality could make a climate revisionist out of anyone. Now you honestly think or have researched and know that the earth is now going into a cooling period: in fact yes it should be because we the little earth is now moving into a period where we are moving further away from the sun. However it would appear we do have a problem in so much of which there is a rather high content of CO2 in the atmosphere. So your contention is that the average temperature on this planet is going to go down in the medium to long term correct? You also contend that any idea of a rise in average temperature on earth is wrong correct? Perhaps we should review this in about say 4 years time. Mind that is such a stupid short time to be ridiculous, however for argument sake lets take 4 years time and look at the situation in 2020. You make a good argument for climate change deniers to just shut up and wait 4 years at which time everyone can resume a civilized scientific discussion. I am with you Harry that deniers should shut up, preferably for ever. But I do not see why sensible people should not discuss climate science. I would not be so quick to reject the idea that the UK (ooops) will not, along with much of western Europe, experience a Younger Dryas-like period of cooling. Although I see Sou intends to cover the YD later on-something to which I look forward-it has been suggested that the YD was caused by a meltwater event screwing up (that's a scientific term) the Gulf Stream. The globe, as a whole, was warming into the new interglacial, but Europe was deprived, for a while, of the warming bath of the Gulf Stream. Seems to me that the Cold Blob south of Greenland suggests this could happen again. Point is that there have been any number of papers recently about AMOC and/or gulf stream that John could have called upon to support (or refute) his argument. He didn't even mention the Atlantic once. His main argument was that the whole world is about to cool because it's bound to cool soon (statistics instead of science). It's just getting hotter and moister in said Western Europe. Forget it, no cooling even with the Cold Blob in place. Flows straight from that direction tend to temps of a degree ABOVE normal ( = 1981-2010! ), and two to six(!! Dec 2015) in wintertime. One of my fav sci-fi authors, Peter F. Hamilton, was born and still lives over on the east side of the UK in Rutland. In his futuristic novels, he imagines the coastal area near there as being a mangrove swamp somewhere around 2060. Considering the current situation regarding GHG warming, I don't think his prediction will be too far off.